Coulometric Karl Fischer titration is the method of choice for low-level water determinations (10 μg – 10 mg absolute water content) in liquid, solid and gaseous samples. Models 851 and 852 execute coulometric KF quickly and easily. Should the water content be too high for coulometric titration, Model 852 can also handle volumetric titration, analyzing samples that range from just a few micrograms of water up to 100%. 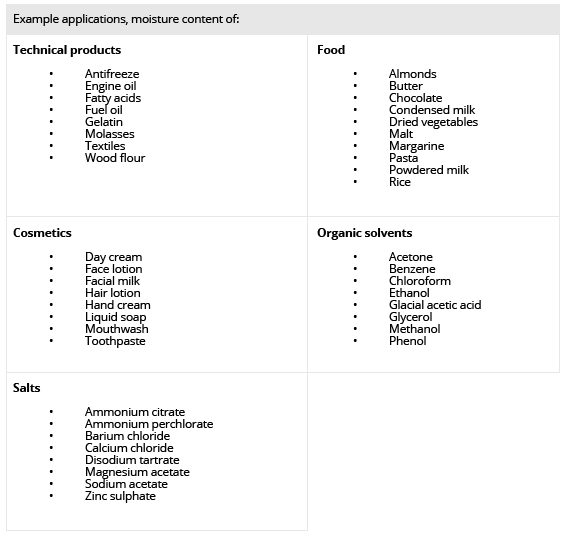 Coulometry is the ideal method for water determination in liquids, solids and gases when it comes to water determination in the trace range (10 µg to 10 mg absolute water). 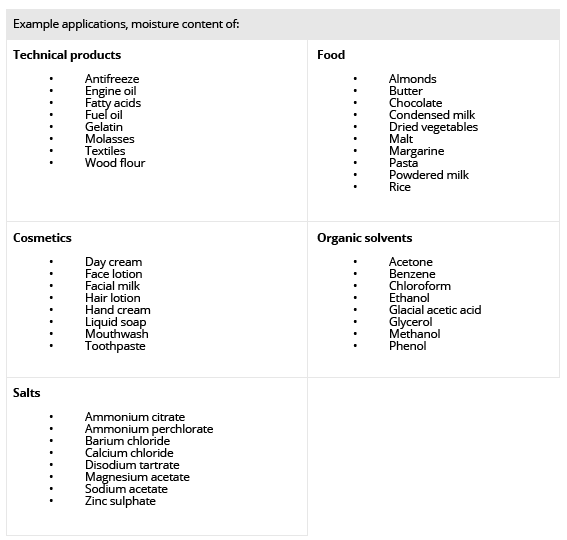 In addition, coulometry is an absolute method and thus no titer determination is necessary. 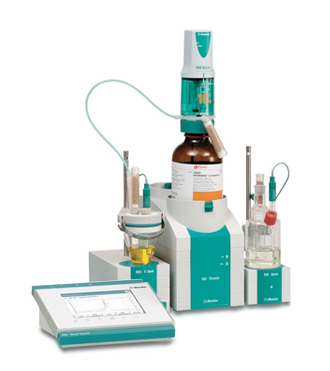 Coulometric titrations are carried out easily and quickly with the 851 Titrando. Recommended measuring range: 10 µg - 200 mg absolute water. The 852 Titrando controls not only coulometric, but also volumetric Karl Fischer titration. ‹AUTO START› determinations. How many times have you had a sample inject into the titration cell without first pressing the start button? The water of the sample is then conditioned away and you need to repeat the process, which wastes sample, reagents and your time. Not anymore! Models 851 and 852 automatically recognize sample additions, and only then will the determination start. Automatic reagent exchange. Connect up to 4 dosing units to either model for the aspiration and addition of Karl Fischer reagent, water standard or auxiliary reagents such as buffer or solubilizers. Because the exchange is fully automatic, you are saved from opening the titration cell and waiting on long conditioning times and reducing your exposure to potentially hazardous reagents! Bromine index can now be determined. Bromine index according to ASTM can be run on our new coulometers without any special additional equipment. Accuracy-ensuring Dosino® reagent dispensing. Our patented “top-down” dosing technology eliminates the build-up of air bubbles that will negatively affect results and reproducibility. Meet the newest volumetric Karl Fischer titrator in our Titrando line, perfect for any lab needing a powerful titrator—but on a “modest” budget. The 890 KF Titrando is the perfect system for analyzing water at levels from 0.05% to 100%. 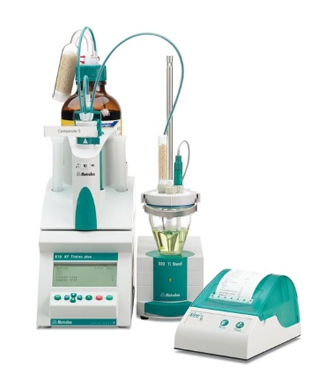 High-end titrator with built-in buret drive for volumetric Karl Fischer titrations. With four MSB connections, one galvanically isolated measuring interface and USB connector. Choose your control: Touch Control features easy-to-use instant-access buttons and a large and easy-to-ready screen—titration has never been so easy! Or choose computer control and the 890 KF Titrando will include tiamo® Light—our very own easy-to-use software interface! Automatic reagent exchange. Connect up to 4 dosing units for the aspiration and addition of Karl Fischer reagent, water standard or auxiliary reagents such as buffer or solubilizers. Because the exchange is fully automatic, there is no opening of the titration cell nor waiting on long conditioning times. The 890 KF Titrando keeps you safe by reducing your exposure to potentially hazardous reagents! Accuracy-ensured Dosino® reagent dispensing. Our patented “top-down” dosing technology eliminates the build-up of air bubbles that will negatively affect results and reproducibility. For information on the related 888 Titrando click here. 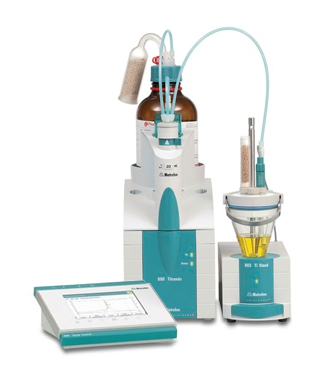 The favorably priced 870 Titrino plus is a titrator for volumetric water determination. It can be used to determine water contents from a few ppm up to 100% reliably and accurately in solid, liquid and gaseous samples. With its operating interface designed for routine users, the 870 Titrino plus is so easy to use that hardly any familiarization is needed at all. Due to its robustness, it is also the ideal titrator for routine determinations. Titration vessel and electrode are included. Easy, safe and precise water determination has never been so simple. 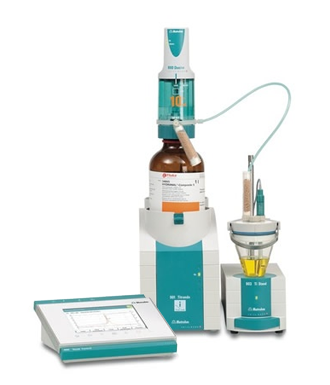 The Titrino plus is Metrohm’s new Karl Fischer titrator for volumetric water determinations. It will measure water content from a few ppm up to 100% reliably and accurately in solid, liquid and gaseous samples. An easy-to-use interface makes this a perfect option for routine users. New monitoring features ensure that the system is always operating safely and accurately. Whether you determine the water content in food, cosmetics or pharmaceutical products, the 901 KF Titrando is always the right instrument. Its sophisticated control algorithm has been adapted to the characteristics of the Karl Fischer reaction, and it ensures fast, highly precise results. You can choose between a polarized alternating current (Ipol) or a defined voltage (Upol) to be applied to the electrode. For set end-point titrations, the 901 features our unique iConnect intelligent electrode. Once the system is programmed, simply press the «Start» button to begin operation. Titrando detects and alerts you to setup errors, and it can remind you to enter in vital information, such as sample size and identifications, before the titration begins. Data that is created with Titrando can be stored internally on a data card or in a PC, or, alternatively, it can be transferred directly to LAN—without the need of a local PC. A titrator is only as good as the results it produces. You can be confident that Titrando will give you accurate, precise results that you can depend on every time. The key is the Metrohm Dosino®—used to dispense Karl Fischer titrant with unparalleled accuracy. The Dosino motor has a resolution of 10,000 steps, and the piston moves from the top of the buret to the bottom, eliminating any effects from air bubbles.